Biceps Tendon Tears Biceps Tenodesis Who Needs a Biceps Tenodesis? Are There Alternatives? The biceps tendon is the attachment of the biceps muscle to the bone. The biceps muscle is named because there are two tendon attachments (therefore, "bi"-ceps) in the shoulder, and there is also a tendon attachment of the muscle below the elbow. The biceps muscle is important both in bending the elbow (flexion) as well as turning the forearm upwards (supination). Biceps tendon tears can diminish the strength of these movements and can also cause a deformity of the biceps muscle. The most common type of biceps tendon tear is a detachment (partial or complete) of one of the biceps tendons within the shoulder joint. There are two attachments of the biceps tendon at the shoulder, one within the shoulder joint (the long head of the biceps), and the other is in front of the shoulder joint (the short head of the biceps). Injuries to the proximal biceps tendon almost always involve the long head of the biceps. When the long head of the biceps tendon is damaged, a treatment that may be considered is called a biceps tenodesis. Biceps tendon tears in the shoulder are a common source of shoulder pain. The biceps is often considered a major "pain generator" in the shoulder, and tears in the biceps are commonly associated with rotator cuff conditions. In order to fully relieve shoulder pain, the biceps tendon problem may need to be addressed. There are different ways to address biceps tendon problems, both surgical and nonsurgical treatments. A biceps tenodesis is one of the surgical methods to address biceps tendon tears. A biceps tenodesis is a surgical procedure performed for the treatment of a damaged proximal long head of biceps tendon. A biceps tenodesis may be performed as an isolated procedure but more often is part of a larger shoulder surgery, such as a rotator cuff repair. During biceps tenodesis surgery, the normal attachment of the biceps tendon in the shoulder joint is detached (if not completely torn already), and the tendon is reinserted to the bone of the humerus (arm bone). When the biceps tendon has ruptured completely, it is obviously not necessary to detach the tendon from within the shoulder. The key to performing a biceps tenodesis is moving the tendon from its normal attachment within the shoulder joint to a new location further down the arm bone. By moving the attachment of the biceps tendon, it is no longer attached to the shoulder joint. This leads to fewer problems down the road, as the damaged biceps tendon can cause problems within the joint. Who Needs a Biceps Tenodesis? The ongoing debate is centered on which of these surgical procedures is better, a biceps tenotomy or a tenodesis. Both procedures have advantages and disadvantages. Both are reasonable options, and one may be better for some patients, and the other for other patients. There is not a better or worse procedure. People generally opt for a biceps tenodesis when they are more active, such as athletes or manual laborers, or if they are concerned about the appearance of their biceps muscle. 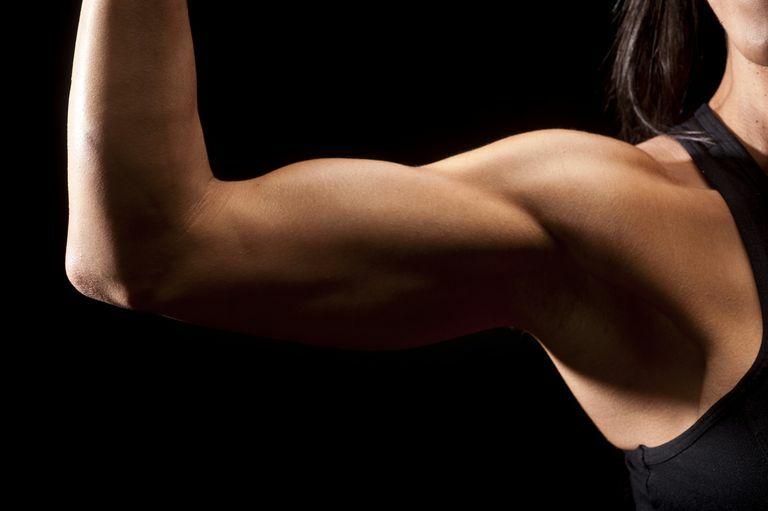 People might opt for the biceps tenotomy if they want a faster healing and want to avoid complications of repairing a tendon and having a longer surgery. Surgical recovery after a biceps tenodesis is usually about four to six weeks. However, as mentioned earlier, often a tenodesis is performed along with other surgical procedures that may require a more lengthy recovery. If having an isolated tenodesis procedure, the patient can expect to wear a sling for a few weeks. Mobility of the arm is started early, but full activities are restricted for a minimum of three months. A biceps tenodesis can lead to surgical complications. Usual complications that can occur with any shoulder surgery include infection, healing problems, nerve injury, and pain. A biceps tenodesis requires that a tendon is repaired to the bone. For healing to be complete, the tendon must reattach to the bone. Failures of the tendon to heal, or failures of devices that hold the tendon during healing, occur in a small percentage of patients. Nho SJ, et al. Long Head of the Biceps Tendinopathy: Diagnosis and Management. J Am Acad Orthop Surg. 2010 ; 18:645-656. Which Walker Is Right for Your Condition?